119. whole wheat sunflower seed bread. My first Joy the Baker recipe! 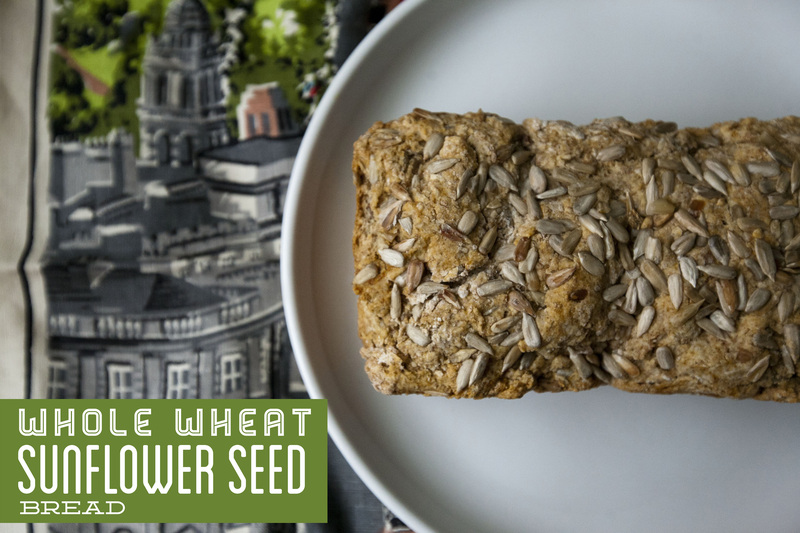 I needed to make something for a potluck, and attempted to veganize this whole wheat sunflower seed bread. This was a nice, dense, savory bread with a touch of sweetness. *If you have raw sunflower seeds, toss them with 1 teaspoon olive oil and one scant teaspoon salt and bake on a cookie sheet for 12 minutes (or until slightly browned) in a 350 degree F oven. Let cool before incorporating into the bread batter. Preheat oven to 350 degrees F. Spray two 9x4x3-inch bread pans with non-stick cooking spray and set aside. In a large bowl, whisk together flours, sugar, salt, baking powder and baking soda. Add the wet ingredients all at once to the dry ingredients. Fold to incorporate. Try not to overmix the batter. Once the flour has almost disappeared fold in the 3/4 cup of the sunflower seeds (reserving some seeds to garnish the top). Fold until no flour bits remain. Divide batter between the two pans. This will create smaller loaves… not huge loaves… just so you know. Bake for 35-40 minutes, being sure not to over-bake and dry out the bread.